Finding a good snack in Paris is not so easy, most of them being just like one another, with pervasive kebabs, panini, and crêpes, and, in some areas, really abusive prices. Thankfully, Kaza Maza is an exception. 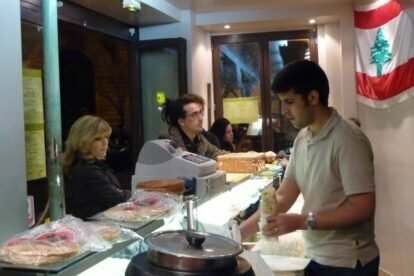 Located in the very popular area near the Panthéon and Rue de la Montagne Sainte-Geneviève, where many local students and young tourists have nights out, Kaza Maza offers excellent Lebanese sandwiches at decent prices (even if they recently raised a bit), considering their quality and the area. The sandwich list is divided into three clear sections: meat sandwiches; cheese sandwiches; vegetarian sandwiches (all cheese sandwiches are vegetarian too). It’s also possible to have, as an appetizer, just a falafel ball or a meatball and obviously, oriental pastries, like baklavas, are also available. The few chairs and a counter are for those aiming to have a food break between two pints in neighbouring pubs. But the place is mostly for take away, and sandwiches are always delivered in a thin plastic bag in order to eat them comfortably and not pour all the sauce over one’s clothes while eating on the run to catch the last metro. Note: there’s another Kaza Maza (same menu) at 16 rue d’Odessa, in Montparnasse area.